When we are born our Soul carries along with it, a suitcase. This suitcase isn’t just any ordinary satchel, not at all, it is a magical attache full of an enchanting array of clothing. Each piece of especially designed cloth has been custom made just for you. Each piece of clothing in your suitcase is purposely a different size, a different colour and shape. There is a reason for this and only your Soul knows the answer. Unbeknownst to you there is a mysterious hidden agenda that comes with your suitcase and all of the clothing that rests neatly inside of it. Your happy that the luggage came with you and you feel blessed to have the beautiful clothes inside of it. One garment at a time, you slowly begin to take the contents of your luggage and try them on. Over time you begin to recognize that some of the clothing fits better than some of the other items in the suitcase. It seems that several of the items are better well made than a few of the other pieces as well. One day you put on a what looked like a very expensive long sleeved blouse, only to have one of sleeves fall off later in the day. Once you had on an attractive looking skirt, it was so graciously soft and flowed right down to your feet, but when you were walking along the street you tripped and fell and bruised your chin. Then there was that hat, you fell in love with it as soon as you laid eyes on it. It fit perfectly and you felt like a goddess when you put it on. Excitedly you wore it out one sunny afternoon, only to have a mysterious gust of wind take it from your head, never to see it again. Over time you begin to methodically piece together the meaning and purpose of each piece of costume that you wear from the contents of your suitcase. Each of the regalia that you have worn over the course of time, had something very significant to teach you, about life. What about the silky long sleeved blouse, the one that had it’s sleeve fall off right in the middle of the day, no warning, no broken threads to repair, it just fell off. Sometimes without warning we face challenges in our life that seemingly come out of nowhere, the Universe is testing us all the time, all the while wanting to strengthen us to help us stay on our path. Loosing the hat that fit you so well, you felt so beautiful when you put it on and cried when the wind took it away. Why does the Universe have to be so cruel sometimes, taking things from us and making us cry? 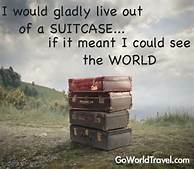 Regardless of what lies in your suitcase of life, even the items that don’t seem to fit so well, and even the stuff that you really don’t like, gracefully, courageously and confidently wear each item and positively trust what it has to show you, teach you and offer you on your journey through this life experience. One day the suitcase will become empty, you will have worn everything that was meant for you to wear. On this very special day you will have the freedom to pick out your own clothes, items that are the perfect colour, the perfect shape and fit absolutely perfectly.